"You make bad decisions" said a coworker as I pulled the relatively massive Asus ROG G751JY-DH71 gaming laptop out of my backpack during a recent trip to our home office in New York City. I'm not certain I did. On a table dotted with various ultra-skinny Macbook Airs and other assorted ultrabooks, the G751JY certainly stood out, with its plethora of ports and its Blu-ray drive. At 1.7 inches tall at its thickest point, it was easily twice as tall as anything my coworkers were using, and at 8.4 pounds it was triple the weight. Yet not one of those other machines was nearly as powerful as the Asus. There's no way any of those systems could play games or process video as fast as my laptop, outfitted with a 4GB GeForce GTX980M. I'm positive none of their systems featured a 1TB Sata drive on top of a 256GB SSD for speedy system booting. And none of their systems had cool vent fins. There was a time when this thickness was a hallmark of a gaming laptop, but over the past few years we seen the rise of super-slim, expertly engineered gaming laptops boasting state-of-the-art cooling in a more portable form-factor. I've reviewed several of them. At one point I declared that I was completely ruined for thicker gaming laptops. Now I'm not so sure. 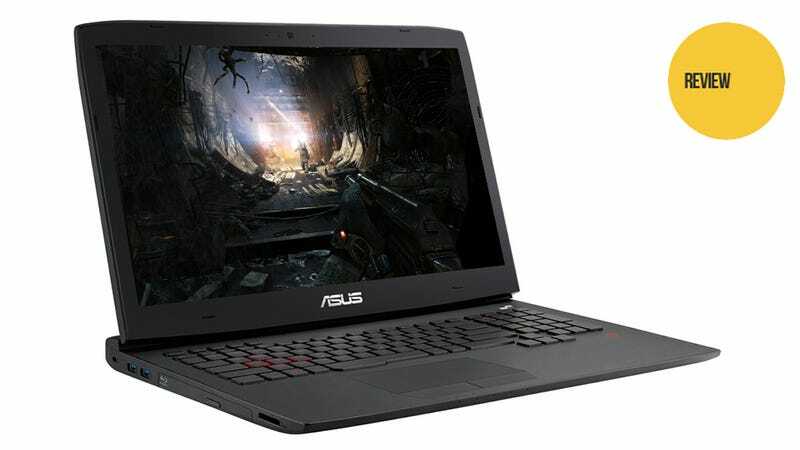 The Asus Asus ROG G751JY-DH71 is, along with proof that Asus needs to come up with better model naming conventions, a full-profile 17 inch gaming laptop. While not as garish as some of its competition, there's no mistaking the ROG for anything but a gaming machine, from the shiny vents to the red-highlighted WASD keys on the backlit keyboard. Here are the stats for the model I've been testing far longer than Asus expected me to be testing it for. Why, I weathered the great New York City blizzard of 2015 with it, that's what I did. While the blizzard wasn't all that great, it did make walking the several blocks between the hotel I was staying at and Gawker's Elizabeth Street offices treacherous, and part of me bemoaned the extra couple of pounds on my back as I slipped and slided down the sidewalk. But after four days of wandering the streets with a backpack filled with $2,300 worth of gaming system, it really didn't make all that much of a difference. I'd imagine if my commute were regularly more than wandering down the hallway to my office, eventually I'd barely notice the extra weight at all. It's not like this is something I plan on pulling out while walking down the street for a quick game of StarCraft II. When gaming or working time arrives, it shall be firmly planted on a surface, and mild portability concerns go out the window. Now the first real day of snowfall, when I stood in line at the food market for 45 minutes wearing two backpacks, one containing the ROG and the other an Xbox 360—that was pretty hellish. Otherwise I used the ROG for work and play. I tested it with my regular gamut of Steam games. I processed video captured directly to the laptop via my capture device. I connected it to horrible hotel internet and caught up on Vikings prior to the start of the third season. I gave it plenty of love, and it loved me right back. Playing With Power: The ROG G751JY-DH71 (damn right I am copying and pasting that) is the first gaming laptop I've tested with Nvidia's GeForce GTX980M, and boy am I impressed. The Maxwell-powered chip demonstrates amazing graphical prowess for a mobile solution, devouring the likes of BioShock Infinite on Ultra and spitting it back out in the low 90 frames-per-second. With Total War: Rome II's benchmark set to max it hovered around 60 frames-per-second, but came in just under with 59 in the end. Most impressive of all, the famously treacherous Metro: Last Light benchmark averaged 32 frames-per-second a maximum settings, making it the first gaming laptop I've reviewed to reach above the 30 mark. A Display of Brilliance: You can keep your full HD laptop screens—give me a nice 1920x1080 anti-glare IPS panel with an amazing viewing angle any day of the week. Asus' Splendid Utility gave me quick access to monitor adjustments, with three presets and a manual slider to adjust warmth to my liking. I spent many an hour staring at this screen, and I'd spend many an hour more. The Keyboard, Part One: The ROG's flat keys are about as responsive as a non-mechanical keyboard can get. Each key has a lovely amount of give to it, making it nearly impossible to accidentally skip over a letter or space. I appreciate the red highlighting on the edges of the WASD keys, making it easy to spot the most important parts of the keyboard. I love the Steam key in the top left corner, and I love a dedicated key to start and stop capture (using Nvidia's Shadowplay) even more. You wouldn't believe how many hours of footage of nothing I have from accidentally hitting the tilde on my desktop. Ridiculously Quiet: With the bright red vents on the back, I fully expected the ROG G751JY-DH71 to roar like a jet engine, so much so that I probably wouldn't have faulted the system for it—two years of skinny gaming laptop exclusivity has skewed my expectations. Yet even in the midst of the most arduous benchmarking, this unit's fans didn't start going crazy. Not only that, but it also stayed cool to the touch—I could play demanding games with this unit on my bare legs, not that anyone wanted that image in their heads. So Many Ports: Ports on laptops are an endangered species. With Apple's next generation of Macbooks shipping with just one hole to rule them all, it's lovely to find a system that will still accept nearly every cord or card I have on hand. Who needs an SD card reader? I need an SD card reader. The moment I purchase a new USB reader it jumps out of my hands and goes running off across the store, laughing hysterically at my folly. Tinny Sound: I figured maybe Asus had used some of that extra room for a nice sound system, but I was sorely disappointed. You can hear the sound coming from the ROG G751JY-DH71, but you probably won't be pleased by its thinness, even with the built-in subwoofer. This is a good machine to pair with a nice set of headphones. Keyboard Part Two: "Can you turn off the backlight on the keyboard? I am trying to sleep." "Sure thing." And now I can't see the keys. Red on black looks great sitting on a desk in a well-lighted room, but my eyes are never adjusting to that color combination in the dark. I probably shouldn't be typing in the dark anyway. The Desktop Wallpaper: "Are you really calling out a laptop on its wallpaper?" Yes I am. Dear Asus. I do not need the product I am using to be the desktop wallpaper for the product I am using. Every time I powered on the system and saw this I laughed, yet for some reason I never changed it. The common complaints regarding larger gaming laptops certainly apply to the ROG G751JY-DH71. It's bulky. It has trouble fitting in a standard computer backpack. It has sad battery life-almost four hours on power saving doing not much, far less if you're trying to game on battery (silly goose). There's always going to be some compromise when it comes to gaming on a laptop over a desktop packed with full-size graphics cards surrounded by an intricate network of cooling fans and coolant tubes. Compared to the skinnier laptops I've grown accustomed to over the past couple of years, systems like the ROG G751JY-DH71 (still cutting and pasting) compromise a whole lot less, and the results are readily apparent. I thought my stance on the gaming laptop battle of power versus portability was firmly on the side of the slender, but the Asus ROG G751JY-DH71 reminded me that while good things come in small packages, you can fit even more good things in bigger one. Not a bad decision at all.